The Governments across the world take decisions on international relations on the basis of a wide variety of inputs and considerations. Among the ingredients is domestic political pressure.Typically, political pressure is built up by the mass media. At times, such pressure is even initiated by the media. By their very nature, the mass media tend to see issues in black and white rather than in shades of grey. And in the sphere on foreign affairs, strong nationalistic sentiments hold sway over the media, vitiating ties with other countries. One of the victims of this is Sino-Indian relations. 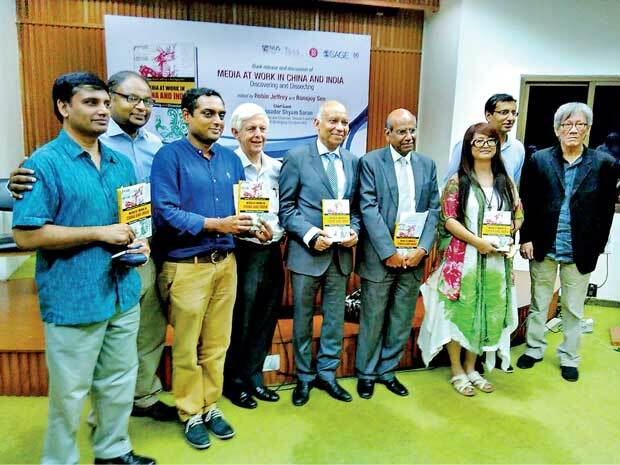 Media at Work in China and India, Edited by Robin Jeffrey and Ronojoy Sen, SAGE India, 2015 brings out the role of the Indian and Chinese media in sustaining and exacerbating Sino-Indian ties through papers written by media watchers, including an Indian and a Chinese journalist with long years of experience in working in China and India respectively. “An alarming inadequacy and confusion pervades India’s media and strategic community when it comes to reporting and analysing China. It’s a limitation that distorts and severely restricts the mainstream discourse that shapes perceptions in India and China,” writes Ananth Krishnan, formerly of The Hindu and now of India Today. Ananth gives the example of a briefing paper put out in 2009 by the Chennai-based Centre for China Studies on “Chinese Strategic plan to break up the Indian Union.”The briefing paper claimed that the above mentioned thesis reflected the official Chinese view because the forum was linked to an official think tank. Predictably, the Indian media went to town on the threat almost derailing the Sino-Indian border talks which were to be held then. The tirade stopped only when the Times of India (ToI) reported that the online forum was not connected to any official think tank. Lack of knowledge of Chinese had resulted in the Indians claiming that the author was one “Zhongguo Zhan Lue”, when it was not the name of a person but a pseudonym meaning “Chinese Strategist”. Ignorance of the Chinese language is a major problem afflicting Indian journalists and experts writing on China, Ananth points out. Indian journalists also assume that everything that appears in the Chinese media is “officially” sanctioned,while the truth is different. Ananth,who has been in China since 2009, points out that China’s netizens not only number in millions but are as diverse in their agendas and opinions as their Indian counterparts. Not surprisingly, the report caused a “storm” in India. But Ananth points out that Prof. Shen did not even mention Pakistan! And she had written the article as an academic, not as the spokesperson of the Chinese government. A Press Trust of India (PTI) report based on a Xinhua story said that China is seeking to expand exploration for poly-metallic sulphide ore in the Indian Ocean thus straying into “India’s backyard.” This again was disingenuous because Xinhua never said anything of that sort. In its report on the speech given by Liu Cigui, Head of the State Oceanic Administration,there was no reference to mining rights or even the Indian Ocean. However, the next day, ToI carried a story entitled:” India, China, square off for sea fight. The oceans are the new theatres of India-China competition,” creating tension in the Indian and security and scientific communities. “The absence of rigorous fact checking in Indian newspapers allows such misinterpretations to remain unchecked. There is no distinction between fact and fiction making it impossible to have any meaningful and informed public debate on China. Sensationalism is undermining credibility,”Ananth asserts. Tang Lu of Xinhua who had studied and worked in India between 1996 and 2016 says in her paper that if the Indian media misreads China, the Chinese media also misreads India. Factual ground-based reporting is absent in both. Both rely almost entirely on secondary media sources many of which are Western and already biased. Tang Lu decided to get out of the rut, given her training as a university researcher and experience of grassroots level work as the Vice Governor of rural Baishui county in Shaanxi province.She trudged across rural Gujarat to know ground realities. The Chinese media are obsessed with the notion that India is aiming to be a “world power” and view its successes and failures from the point of view of this goal, Lu observes. When Pakistani terrorists staged a devastating attack on Mumbai on November 26, 2008, the Chinese media went to town saying India’s dream of becoming a world power lay shattered. But Tang Lu wrote a piece saying that just as one or two achievements cannot make a country a world power, one or two terrorist attacks cannot stem India’s progress. Likewise, when the power grid in North India collapsed in July 2012, the Chinese media claimed that over 670 million Indians were stumbling in the dark and that India’s pretentions about being a world power lay shattered. But in her dispatch Tang Lu pointed out that millions in North India had no access to electricity anyway to warrant the conclusion that plans to become a great power were shattered by the power failure. Comparison of the militaries of India and China is another favorite story in the media of the two countries. In February 2009, there was a popular Chinese media story about the Chinese navy forcing an Indian submarine to surface in the Gulf of Aden. To match it, the The Hindu and ToI said that an Indian submarine had followed the fleet of a “certain nation” for a week and simulated 39 attacks on it. But ground level investigation later revealed that the original story put out by Qindao Morning News of China was “fake”. The Indian and foreign media had been taken for a ride! Just as the Indian media is hostile to China, the Chinese media is also hostile to India. Both have a penchant for picking up published material which reeked of nationalistic belligerence. Both Indians and Chinese have the wrong notion that their media are monolithic with no diversity. “The Chinese do not know that for every 100 Indians there are 101 views and Indians do not know that the Chinese media is very diverse,” Tang Lu points out. “In fact, Chinese media can publish their own exclusive opinions although all media are under government regulations. The views do not represent the government’s stance. It is more or less the same as the complicated Indian media,” she says.